Is there a furry friend in your home? Home > Blog > Is there a furry friend in your home? As previously discussed on this Blog in the first week of October, it is National Adopt a Dog Month! There’s certainly no shortage of dogs who could use a good home so why not adopt a dog to come live with you instead of a nervous, noisy shelter. You can make a dog’s day (and also its future) by bringing one home with you today. 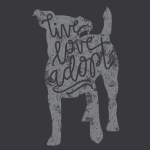 Everything Summer Camp is selling our ‘live love adopt’ T-shirt and donating the proceeds to the American Society for the Prevention of Cruelty to Animals (ASPCA) to help spread awareness that October is a month for adopting dogs from shelters. Based in New York City since its founding in 1866 the ASPCA is a non-profit organization which is dedicated to preventing cruelty toward animals. If dogs are dear to you and you’ve been entertaining the idea of getting a dog, make today the day you seal the deal and go find yourself a friend at your local shelter. If not today, then make sure you make October the month that you take action. Make visits to shelters and meet with the dogs there. Giving a dog a good home is such a gigantic act of kindness; when you show an animal this kind of love, you’ll receive that much love in return from your new pet. They’ll be the most excited one to see you when you get home, they’ll protect you thoughtlessly, and love you unconditionally. Get off the fence and go find a dog to bring home in celebration of National Adopt a Dog Month! And don’t be afraid to give your hesitant friend or relative the push they need to make the right decision too. Anyone can help get a good home for a dog!